Laser Range Finder, Rangefinder, hunting, lazer, Leica Scan, Swarovski Laser Guide, Bushnell Elite, Leupold Rangefinder, Bushnell laser, CRF 1200, CRF 1600, LRF 1200, Nikon Rangefinder, Infrared Laser, Laser Ranging, Hunting. Introduction: Laser Rangefinders allow hunters to quickly and reliably range their targets. Today there are more choices than ever, from $130 up to $3000 or more. Most of the “consumer/sport” units actually have the same laser power output, as this is regulated for safety reasons. But the difference in “real-world” field performance is quite striking. Some units advertised with 1500-yard capability won’t range deer reliably past 600 yards. The difference is in the details. The best laser rangefinders have expensive optics, tightly collimated beams that hold their “focus” at extreme ranges, and superior error-correction software. In this article we review the leading rangefinders marketed with 1000-yard+ capability for hunters and sport shooters. Among these, the $889.00 Swarovski Laser Guide offers the greatest reach. It really can range objects out to 1500 yards and beyond. The Leica LRF 1200 won’t range as far, but it is a high-quality, user-friendly unit, with important features that reduce the likelihood of false returns. The Leica CRF 1200 sets new standards for light weight and compactness. It is the premier “pocket rangefinder”. BEST OVERALL: Swarovski Laser-Guide ($889.00). The top performer among “consumer” laser rangefinders is the Swarovski Laser Guide. Its 8×30 monocular is the best. Past 1000 yards, it ranges deer and man-sized silhouette targets better than anything under $3000, and its maximum reach (on highly reflective objects) beats the competition. The Swaro’s only notable shortcoming is its targeting reticle–an illuminated circle that is just too big. Swarovski should provide a variable aiming circle, with large and small settings. BEST PERFORMER for the PRICE: Leica LRF 1200 ($469.00). When you consider “value for dollar” the Leica wins out. It matches the Swaro’s performance except at extreme ranges. You can buy a Leica LRF 1200 Scan for as little as $470.00–about HALF the cost of the Swarovski. This is a quality unit that gives up very little to the Swaro out to about 900 yards. It ranges very fast and Leica’s aiming dot beats the Swarovski’s oversized aiming circle. Leica’s 0.5 millirad vertical beam dispersion, the tightest in the industry, reduces the chance of scanning errors. The LRF comes with a 3-year electronics warranty, compared to 2 years for the Swarovski. When considering Price for Performance, we choose the LRF 1200. 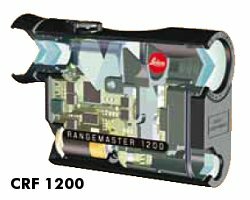 BEST POCKET RANGEFINDER: LEICA CRF 1200 ($599.00). We were also impressed with the Leica CRF 1200, an extremely compact unit introduced in 2006. The CRF’s laser and optical performance matches its LRF bigger brother, yet the unit is truely small enough to fit in a shirt pocket. With its efficient circuitry, the CRF offers double the battery life of most other rangefinders. The CRF is designed to be held vertically, with the monocular on top. Much lighter than the Swarovski, the CRF is very comfortable to hold in one hand. However, the wide, flat design of the older LRF model works better when held (binocular style) with both hands, or placed on a rest for long-range work. HONORABLE MENTION: Bushell Elite 1500 ($360.00). 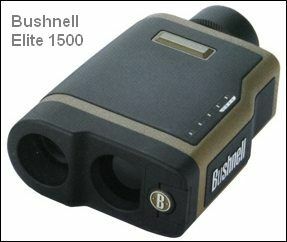 The Bushnell Elite 1500 is a good unit with many sophisticated features. At under $360.00 “street price”, it is an excellent value. We liked the fact that you can click among three modes: Standard (for most situations), “Bullseye” for short range, and “Scan” if you want to get a continuous series of readouts on multiple targets. The Elite 1500 also comes in an “ARC” version with built-in angle compensation. This would make the Elite 1500 our first choice for bow hunters. “Best in Category” is indicated in Red. 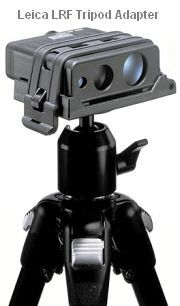 *OpticsSpot.com has the Swaro for $839.00, but Swaro price-controls at $889.00. Last spring I decided to get a few of my friends together for an antelope hunt. Since they were all members of the Precision Long Range Hunter Forum, our rangefinders were sure to get a workout. Ric Horst was trying out the new Swarovski 8×30 Laser Guide. John had the Swarovski as well, Steve was carrying a Bushnell 1500, Derek and I both had the Leica LRF 1200 Scan models. Just to throw a wrench in the works, we also had the new Nikon 1200. We were hunting in the high desert region, near Medicine Bow, Wyoming. Terrain ranged from sage brush flats to rolling hills covered in grass. A few canyons, buttes and bluffs completed God’s country. This type of terrain had historically absorbed lasers like a sponge. The year before, Ric and I both had the Leicas, in addition to Steve’s Bushnell. The Wyoming sage ate Steve’s Bushnell for lunch, and wouldn’t give any readings past 400 to 600 yards, no matter what the conditions. Our Leicas were a little disappointing also, not giving consistent readings past 800 yards. This disappointment leads Ric to buy the new Swarovski 8×30 Laser Guide for this year’s hunt. This year the Nikon and Bushnell, once again, were soon left in the truck, as they proved to be unreliable beyond 400 yards. On this particular hunt, our closest shot was just under 200 yards, and our longest was 777 yards, with the average running in the 500- to 600-yard range. Fifteen animals total were taken with 18 shots being fired. The three extra shots were due to the poor performance of the Nikon and Bushnell units. This left the Leicas and the Swarovskis in a head-to-head battle. As much as I like my Leicas, I have to give top honors to the Swarovski range finders. In a few instances, the Leica could not give a reading where the Swarovski would. We were using them side-by-side to confirm each other, but quite often the Leica would not confirm the reading given by the Swarovski. Target reflectivity was definitely the determining factor in performance, unlike light conditions, which appeared to have little effect at all. Ranges were in the 900- to 1500-yard zone during these side-by-side trials. For example, the Leica would not give a reading on an antelope at 900 yards, but would range the bluff behind it that was 1100 yards. The Swarovski let us down only on antelope at 1200-1500 yards. But that was at the upper end of the Swaro’s stated capabilities. The biggest problem we did have with the Swarovski was accurately aiming at the intended target. The circle that is used as the aiming reticle is so big it would sometimes be difficult to tell exactly where your laser was hitting. [Editor’s note–The outside of the circle is 20″ (20 MOA) at 100 yards.] 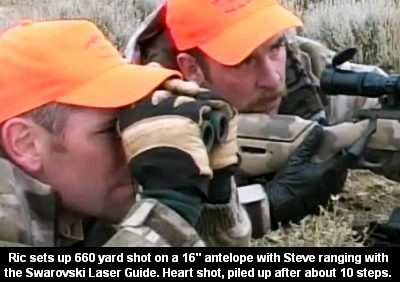 For example, when the Leica, with its smaller, oval reticle would give a reading of 700 yards, the first reading of the Swarovski would say 775 yards, indicating that the laser missed the animal and was ranging the ground behind it. A steadier hold was needed to center the antelope in the circle and confirm the 700-yard Leica reading. It seemed like the circle of the Swarovski covered a 6-foot tall man at 600 yards. Any little wiggle and you would get a reading over, under, or around the animal. Only with a steady hold on the antelope, with the circle centered, would you get an accurate reading. The Leica’s much smaller “race-track” oval reticle did have the advantage over the Swarovski in this situation. Overall you can’t go wrong with the Swarovski or the Leica. If you own a Leica already, I wouldn’t rush out and buy a Swarovski, but if you’re in the market for a laser rangefinder, the Swarovski would get the nod. With that said, this fall you will find me using a newly acquired pair of the Leica 10×42 GeoVids. The GeoVids represent the best of both worlds–awesome binos with high quality glass–plus the bonus of a built-in rangefinder. My initial field outings with the GeoVids indicate that they will handle most any situation that hunting can throw at you, but that’s another story in itself! AccurateShooter: All the rangefinders, regardless of price point, have pretty much the same laser power output. So why aren’t the cheaper units good enough? 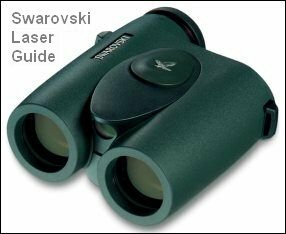 Chris: The ranging capabilities of the Leicas and Swarovskis are WAY better than the Bushnell, Nikon or other cheaper laser rangefinders (LRFs). The old adage of “you get what you pay for” is very true here. In our field tests with them in Wyoming, Ric and I have found the cheaper versions weren’t much good on antelope in the high desert and even the Leicas and Swaros were well under their max range. The problem is with Laser Beam Divergence–i.e. how tall and wide is the laser beam at the target at X range? The laser beams on the cheaper LRFs diverge (expand) more at long range. These cheaper rangefinders might give you a reading on what you think is the antelope, but most of the cone-shaped laser beam is going past the target and actually reading off something behind it. This means that, for example, when the antelope is actually at 937 yards but the hill behind it is 1000, you’ll get a false 1000-yard readout even if you hold rock steady and scan multiple times. So then you dial for 1000 and boom–High!–clean miss. The Leicas and Swaros are not perfect, but they do have a smaller beam divergence and that allows for a more accurate reading. AccurateShooter: Were the Nikon and the Bushnell not durable enough for the conditions or terrain, or was the problem mainly that they would not range accurately? Chris: We couldn’t test the ruggedness of these due to the fact they simply would not range that far and quickly were “excess” baggage. The Swaros and Leicas got the crap beat out of them yet performed admirably. We did one stalk where we literally crawled for a mile on our bellies. That stalk took three-quarters of a day. I rubbed right through the nylon Leica case (the factory one that comes with it). The case was on my belt and crawling a mile over rock and cactus shredded it. The Swarovski plastic rangefinder case held up but was noisy, scraping across the rocks. AccurateShooter: Have you tried the new Leupolds? They come in different flavors–the RX-IV model is the top of the line. 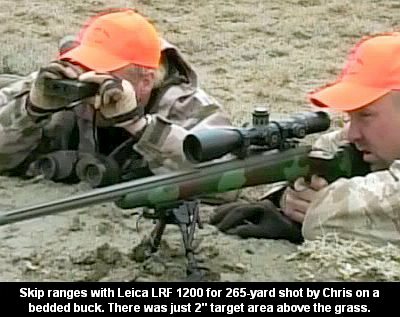 Chris: Leupold sent one of the low-end models and I decided it wasn’t even worth writing about because, in initial testing, it couldn’t range animal-sized targets even at 500 yards. Also, the viewfinder was way too busy with lots of little icons crowding the field of vision. That’s not what a hunter wants, when you have maybe one quick chance to range an animal and break the shot. You don’t want to be distracted by a dozen little icons. In my opinion the Leupolds are better employed as short-range lasers, more suited to the “average” hunter in tree stands. Looking at the product literature, and the emphasis on angle compensation, it seems like Leupold was directing this product towards bow-hunters. Personally, I would find it awkward to try to sort out all the functions and icons on a hunt. The Leupold was so complicated I had to carry the manual around in the field. AccurateShooter: How does the Leica feel in the hand compared to the Swaro? What about the location/feel of the buttons? Did you have problems with either the Swaro or the Leica using any important controls or functions? Chris: Having used the Leica for two years on several hunts, I was quite used to its feel, so the Swaro did feel a bit awkward at first. The Swaro unit looks like a set of binos but being a monocular, this did make holding it a bit awkward. Control buttons on both Leica and Swaro were a little bit hard for me to activate. But then I have huge hands (I am 6’6″ and 260 pounds). The controls made for more “normal”-sized hands and they would work fine for most users. I had no problem employing all the important features on both the Leica and the Swaro. 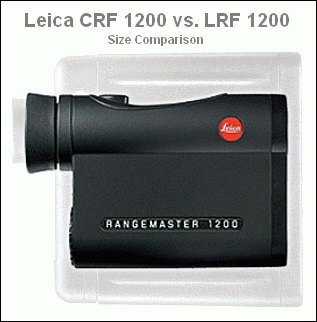 AccurateShooter: Have you seen or tried the CRF 1200 Leica? It’s quite compact, and it really does fit in a coat pocket. Chris: Compactness is good if it encourages you to take the unit out in the field when you might otherwise leave it at home. However, something that’s really small may also be harder to hold securely with both hands or when rested on a rucksack. I’m wondering if maybe the CRF 1200 is a bit too light and small to hold securely. Keep in mind that ALL of the rangefinders we tested worked best if we used an improvised rest to hold them steady. 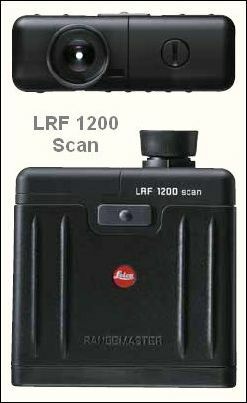 The older Leica LRF 1200, with its wide, flat design might work better rested than the new CRF 1200 which is designed to be used in a vertical orientation. Users should remember that no matter how precise and accurate a rangefinder is, you won’t get good results unless you can hold the rangefinder steady–real steady. In that respect, using a laser rangefinder is no different than aiming a scoped rifle. You need to hold the rangefinder rock steady to range deer-sized game at very long distances. Bargain Price (under $360). Costs less than anything else that will hit 1500+. Ranges quickly and ranges out past 1000 yards better than other low-priced LRFs. Tough, waterproof housing that floats. RainGuard™ lens coating really works. “Brush Mode” filters out false returns from close objects. Beam Divergence greater than Swaro or Leica, so more chance of false readings at long range. Note Bushnell’s own Product Description describes its Ranging Performance as: “Reflective–1600 yards; Tree–1000 yards, Deer–500 yards, Flag–400 yards”. Optics are a grade below Swaro or Leica, and even Nikon. Backlight is not very effective. Unit is relatively large and boxy. Some retailers have reported higher rate of return (10+%) than other brands. Optional ARC™ Angle Compensation (in more expensive model). Tripod mount. Triple-mode Target Priority: “Bullseye” (filters out distant background), “Brush” (filters out close objects), and Standard with Automatic Scan. Oversize ocular with diopter adjustment is good for eye-glass wearers. “I have now used it on 3 elk hunts, numeous jackrabbit shootings, prarie dog hunting, and playing guess the yardage and have had no problems. I have seen over 1600 on the display on reflective targets in good conditions. Most everyone thats used it likes it and one friend bought his own after hunting with it. The low light LED is not much help in complete darkness but I don’t hunt in the dark anyway. The brush mode works like a champ and ranges through branches to give the yardage on the other side.” –John H.
Very good glass–second only to the Swarovski. The new CRF 1200 has TWICE the battery life of all other rangefinders. Ranging is ultra-fast with no latency. Tightest vertical beam dispersion in the business (0.5 millirads) means fewer false returns. The unit is very lightweight and very compact. “Water-tight” to one meter. Unit is so small that it can be a challenge to hold it ultra-steady. No tripod attachment. No distance-selection filter to eliminate returns from close objects or when ranging through brush. Beyond 800 yards, the CRF’s ranging ability on deer/antelope sized targets is severely tested. Don’t count on ranging game easily at 1000 yards, as you can with the Swarovski. Extended (2000 scan) battery life. Advanced lens coatings. Scan Mode displays continuous distance readings as you pan and scan multiple or moving targets. LED display automatically adjusts to ambient light levels. Eye-glass friendly turn-down eyepiece, with adjustable ± 4 diopter. Very good glass–second only to the Swarovski. The LRF 1200’s warranty is the best–3 years on electronics, 5 years on optics. Tightest vertical beam dispersion in the business (0.5 millirads) means fewer false returns. Sophisticated error-rejection software. Excellent value, with prices now well under $500.00. Wide, flat, brick-like design is very stable when rested on a pack or flat object. LRF 1200 is merely “water-spray resistant”. Most competitive units, including Leica’s CRF 1200, are “water-proof”. No distance-selection filter to eliminate returns from close objects or when ranging through brush. Beyond 800 yards, the LRF’s Ranging ability on deer/antelope sized targets is severely tested. Don’t count on ranging game easily at 1000 yards, as you can with the Swarovski. Scan Mode displays continuous distance readings as you pan and scan multiple or moving targets. LED display automatically adjusts to ambient light levels. Eye-glass friendly turn-down eyepiece, with adjustable ± 4 diopter. Optional ($59) clamp-on Tripod Adapter (see photo). Quality 8x28mm optic. Many features for the price. Choice of 13 aiming reticles. Fully armored. Good water-proofing. Distance Filter allows unit to ignore returns inside 150 yards (good for ranging through brush). Unit is available in Gray or Mossy Oak “Brush™” Camo. Unit even has a thermometer and digital compass. Leupold RX Feature Demo. Unimpressive ranging past 600 yards–won’t run with the Leicas or Swaros. Effective range (on deer-sized objects) is less than claimed 1200 yards. View in eyepiece is too crowded with LED readouts and icons. User options are too complex–you almost need to carry the manual into the field for reference. Simpler would be better. Note, despite the RX-IV’s claimed 1200-yard rating, some retailers’ descriptions indicate: “800 yards for Deer, 900 for Trees”. “True Ballistic Range™” Angle Compensation. Back-lit display for twilight use. “Rain Mode” corrects for rain-drop interference. The RX-IV has a thermometer, and a compass with declination. Bargain priced. Better glass than most $400 rangefinders. Light-weight (9.8 oz.) and compact. Guaranteed waterproof and fog-proof. Eyepiece has diopter, and is “eye-glass friendly”. 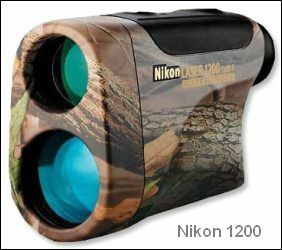 Nikon 1200 is available in various colors including RealTree camouflage. Long (18.6 mm) eye-relief is a big plus. Unimpressive ranging past 600 yards–won’t run with the Leicas or Swaros. Field performance was disappointing. Designed to be held vertically, the unit is harder to holder steady than horizontal-oriented units. Target Priority with First Target and Distant Target Modes. Tripod adaptable. Automatic power shutoff after range has been displayed for eight seconds. Unit is nitrogen-charged and O-ring fitted. Truly superior long-distance ranging performance. The Swaro ranges farther than anything else under $3000–trees can be ranged at 1600 yards. Beam return is positive and repeatable. Wide range of diopter adjustment, from ± 4 diopters. Excellent glass–the best available in a monocular-style rangefinder. Basically, you get half of a premium pair of binos. Aiming circle (13 MOA inside diameter) is too large. Makes aiming small objects at long distance tricky business. Some delay (latency) when scanning in normal mode. Includes built-in 1/4″ UNC tripod connection. Unit comes with plastic hard case and straps. Adjustable push-in eye-cup allows full field of view even when wearing eye glasses. Waterproof to 13 feet. As with a target scope, when using a laser rangefinder, you need a precise point of aim if you want to “hit” a small object at very long distances. The Bushnell and Leupold RFs have a variety of user-selectable contrasting cross-hair patterns, while the Swarovski has a large red ring, roughly 20 MOA in diameter on the outside, 13 MOA on the inside. The Swaro’s ring has the benefit that it provides an un-obstructed view of the “target” at short and medium ranges, but at long range, it is just too big. Overall, Leica’s simple, small red oval seems to work the best at all distances. It gives you a precise aim point, centered on the “target” and doesn’t obscure what you’re viewing. (Leica’s LED readout also automatically adjusts to ambient light conditions.) The complex cross-hair patterns of the Leupold and Bushnell are “busy” and obscure the ranging subject more than we like. At least Leupold does offer multiple digital reticles (show below), so you can choose a simple reticle, such as the Bracket Square with Plus Point. When your target is located at an up-angle or down-angle relative to the shooter, the “Ballistic Distance” to the target is different that the line of sight. Whether you’re shooting up, or down, the ballistic distance will always be less than the straight-line distance from you to the target. This is because the force of gravity will be working over a shorter span. 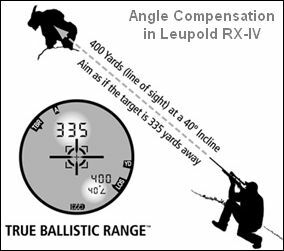 Both the Bushnell Elite (with ARC) and the Leupold RX-IV include built-in angle compensation. This give you the true “Ballistic Distance” to your target, which you use to set the elevation on your rifle scope. The systems work very well, and are most useful in situations where there is a very high angular deflection, such as when shooting from a ridge down into a valley, or when shooting downwards from a tree stand. It is a nice feature to have if you hunt in mountainous terrain. The compact Leica CRF 1200 is rated for 2000 scans. All the other units are rated to a minimum of 1000 scans. But these numbers are a little misleading. They are based on a minimum average scanning time on a highly reflective object well within the units’ max range. The real world is different. If you’re not getting a good return, you may have to scan an object multiple times–and that uses battery life. The faster you can get a reliable reading, the less drain on the battery. The better units (Swarovski and Leica) will return a reliable return in fewer tries. This is because they have higher quality glass, higher-quality sensors, and more sophisticated error-rejection software. The premium RFs also have faster “response time” than the cheaper units. Therefore, in the real world, if you do a lot of scanning past 500m, you can expect the batteries in a Swarovski or Leica to last longer than the bargain-priced units. Also keep in mind that the performance of all the units will degrade as the batteries drain. One Leica that didn’t seem to range very well past 800 yards improved dramatically with a battery replacement. Laser beams in commercial rangefinders expand in diameter as they reach out through the air. This is called “Beam Divergence.” As the beam spreads out, this degrades the rangefinder’s ability to return reliable range data in two ways. First the beam has less intensity when it hits the target. Second, the ever-expanding cone of laser light is more likely to reflect off objects other than your target. Excessive beam divergence in cheaper rangefinders limits their effective range because the beam energy is dissipated over a wider area. The best rangefinders have very coherent beams with reduced divergence. The Swarovski’s beam divergence is 2 millirads in all directions (laterally and vertically). The Leica LRF and CRF 1200 have a unique rectangular divergence pattern that is 2.5 millirads horizontal and 0.5 millirads vertical. Leica’s 0.5 vertical beam divergence is the tightest in the industry. This means the Leica is less likely to return erroneous readings from ground scatter or from objects that are above/below the aiming point. In the field, our observers have found that the Swarovski will sometimes return readings when the Leica will not. In some cases this is because the 2 millirad-tall Swaro beam is hitting the target while the tighter 0.5 millirad Leica beam misses the target high or low. That’s not necessarily a flaw in the Leica, since it lessens that chance that you get a false scan return. But it does mean that your vertical aiming must be more precise with the Leicas. Since the Leica beam is one-fourth as “tall” as the Swaro beam, you need to ensure that your beam is centered precisely on the target. Ground scatter occurs when the rangefinder’s laser beam bounces off terrain features or brush on the surface. This can cause false readouts or can interfere with the return signal from the object you want to range. Unless you’re hunting on the Bonneville Salt Flats, you’ll not have a perfectly flat surface (like a billiard table). There will be rises and dips in the land, and vegetation will be between you and your target. To lessen the effects of ground scatter, range from as high a position as possible. If you need to stay low, as when stalking, you need to hold your rangefinder very steady. Also, you will get much better results with units, such as the Leica 1200s, that have minimal vertical beam divergence. With a 0.5 millirad beam divergence, the Leica’s laser is less prone to be “fooled” by ground scatter than lasers on other units. 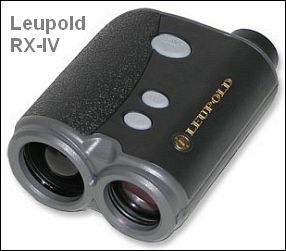 To minimize ground scatter and brush-interference problems, some rangefinders, such as the Leupold RX-IV, offer a “long-range” mode that will ignore readings inside 150 yards. This is very handy when you are trying to range an animal or object positioned behind brush or foliage. Of course this is not fool-proof and the best solution is still to have a beam that remains very narrow and tight all the way to the target. Rangefinders vary in response time. The Leica CRF 1200 is the fastest we’ve tried. Response is almost instantaneous. The Leupold unit was very fast also. The Swarovski Laser Guide, in “normal mode”, can show a delay of a second or more because it uses a capacitor to “power up”; the laser. That might only be an issue if you are attempting to range a fast-moving object or a varmint that pops up briefly into view and then darts back down its hole. And in “scan” mode there’s no delay. We recommend you go to Cabela’s or other large outdoor sporting store and test the response times yourself on the various units. One other timing factor that is less obvious is pulse rate. All the rangefinders use multiple ranging pulses and then average the samples to provide a reading. The Swarovski and Leica use the most sophisticated pulsing system. This, combined with higher grade optics, and better error sampling, reduces the amount of false reads. Leica’s error-detection software is more aggressive than other brands. This reflects Leica’s philosophy that it is better to deliver no reading rather than a false reading. Laser Rangefinders are sophisticated, but they don’t possess intelligence. They can’t distinguish between that big rock 30 yards in front of you and the deer 150 yards further out. Normally, the rangefinder will return a reading on the most reflective object in the laser’s “line of sight”. If that’s the big rock, you won’t get a reading on the deer. To overcome this problem, manufacturers employ various software tricks to isolate targets. The first is a simple distance filter. On the Leupold RX-IV, for example, you can tell the unit to ignore all targets less than 150 yards (see red circle at top of right photo). This is a useful feature, particularly when you are ranging through brush and branches. Bushnell’s “Brush Mode” feature is similar. It displays only distant background objects, ignoring brush and tree branches in the foreground. When you have multiple targets in the line of sight, sometimes you’ll get the range of the most distant target, sometimes the nearest target, and sometimes the rangefinder will produce an average distance as it struggles to choose between targets. “Target Priority” allows the user to select among targets. On the Leupold RX-IV, you can select “1st TGT” to give the range to the closest object or select “Last TGT” to give the range to the most distant object. Bushnell’s “BullsEye Mode” works much the same way–displaying the closer of two objects on the internal LCD. Target Priority is a nice feature, but in the field it may be faster just to take multiple readings until you are confident of the range of your primary target. 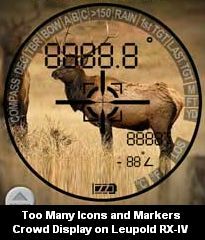 Prioritizing targets with software requires you to click through menus and push buttons in the right order, when that “once-in-a-lifetime buck” may be on the move. As hunting tools, laser rangefinders need to be shielded against “hard knocks” and wet environments. All of the units tested had some degree of water-proofing. The Bushnell Elite, advertised as 100% waterproof, features patented Rainguard® water-repellant lens coatings that shed raindrops and resist fogging–and the Elite 1500 even floats! Swarovski says its Laser Guide is “waterproof” to 13 feet (4 meters). The Nikon 1200, being O-ring sealed and nitrogen-purged, is advertised as both fog-proof and waterproof. We saw nothing in the field to discount this claim. Leica claims its compact CRF 1200 is fully sealed and “watertight to a depth of 1 meter”–good but not great. What’s worse, Leica’s LRF 1200 is only listed as “water spray resistant”. Hmmm, that’s not too reassuring. Overall then, if you use a rangefinder in a very wet, rainy environment or on a small boat, your best choices would be the Bushnell Elite, Swarovski, or Nikon 1200. Cabela’s Buyers’ Guide (Rangefinders), by K. Sigler for Cabela’s. Swarovski Laser Guide Review, by Mike Scoby for Cabela’s.com. Bushnell Elite 1500 Rangefinder, Product review by Randy Wakeman for ChuckHawks.com. Leupold RX-III Laser Rangefinder, Product review by Chuck Hawks. Vetronix Vector-IV (4000m) Rangefinder. Excellent illustrated review of $12,000 military-grade rangefinder by Cory Trap, Gunsite Academy. Topics: Rangefinder, rangefinder, range finder, laser, laser guide, laser ranging, hunting optics, CRF, LRF, 800, 900, 1200, 1500, 1600, infrared laser, ARC, Scan, Scanning laser, Monarch, Bushnell, Bushnell Elite, Rangemaster, Burris, Leica, Leupold, Nikon, Nikon 1200, Swarovski, Swaro, Swarovski Laser guide, waterproof, sampling rate, Angle compensation, Ground Scatter, error correction. Copyright © 2010, AccurateShooter.com | 6mmBR.com, All Rights Reserved. No reproduction without advanced permission in writing. Bushnell, Leica, Leupold, and Swarovski product photos provided by manufacturers, used by permission.